What better deal is there to than to find packs of Allen and Ginter in the discount/clearance racks...well maybe some discount Topps Chrome...but still, there's not much that is better to the baseball card collector. 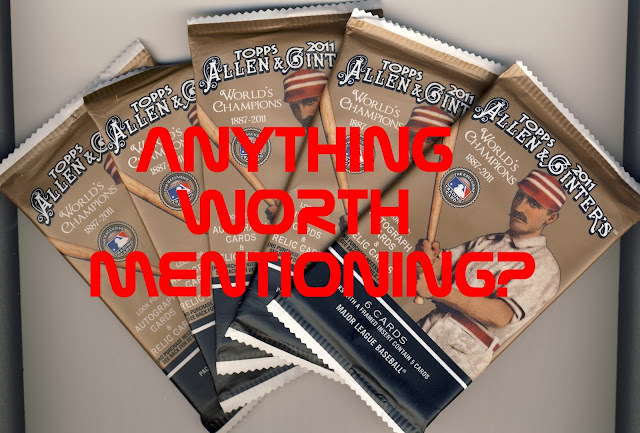 I found five packs of 2011 Topps Allen and Ginter in the clearance box at Shopko while home in Wisconsin and although it is without question the worst Allen and Ginter set design I would buy packs of it for $1.50 all day long. But the question was, did I get anything worth mentioning? Well, I'll always mention the minis in Allen and Ginter packs. They are practically the reason I love the set so much. In this group I got a "black border" of Jack LaLanne as well as a Ginter-back version of the rookie card of the late Mariners prospect Greg Halman. Plus, the Zack Greinke turns out to be a short-printed mini. Staying on the subject of short-prints I also pulled three regular base short-prints from my five packs. So that is four short-prints pulled out of five packs...not too bad if I was actually trying to build this set. My last two interesting cards are inserts that are fairly hard to pull. The "Sketches" fall 1:6 packs and the "Minds" set falls at one in every eight packs. 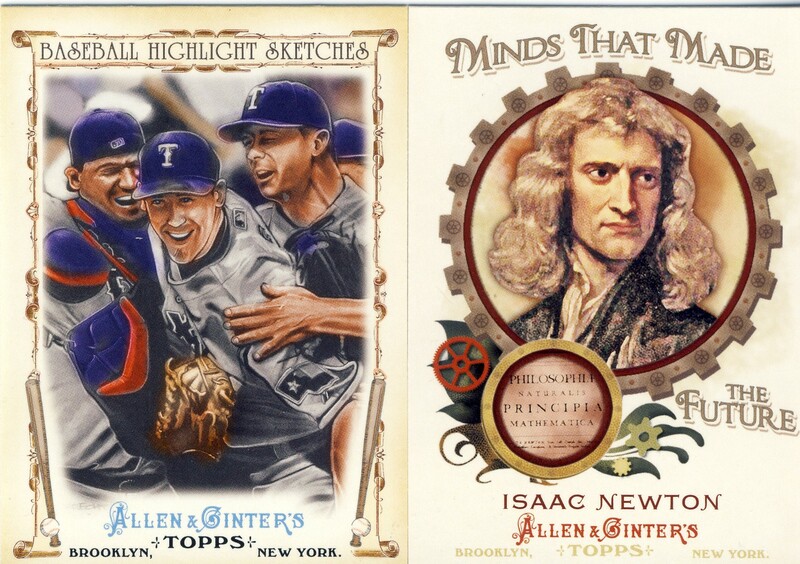 Overall, the Isaac Newton was my favorite card from the packs. Love me some discounted packs! Good to see you back!